KVS PGT Economics Exam Guide: Hello Aspirants, as we all know that the Kendriya Vidyalaya Sangathan is going to conduct written test for 8339 posts of Teaching Staff. Candidates who have recently applied for the post of KVS PGT, now they are started looking for Best and appropriate Books for KVS PGT Economics Exam. 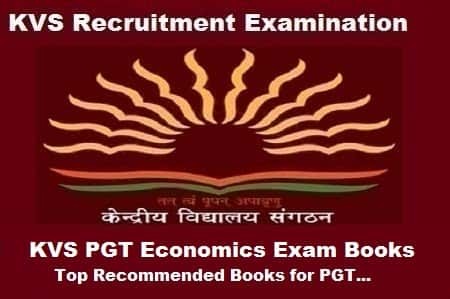 there are many KVS PGT Economics Books which are available for the same subject, now choosing an appropriate book according to the KVS Recruitment examination pattern is a very Crucial problem for all the aspirants. so in this article, we will provide you with the detail information about the KVS PGT Economics exam Preparation Books. On the basis of the written test, candidates will be eligible to qualify for the Interview, hence making the written exam Very Important. Plan your study schedule with these highly recommended books for KVS PGT Economics for sure success in the written exam. Introduction Central problems of an economy, production possibility curve and opportunity cost. Consumer’s Equilibrium – meaning and attainment of equilibrium through Utility Approach and Indifference Approach, Demand, market demand, determinants of demand, demand curve, movement along and shifts in the demand curve. Agents of production. Production function. Cost and Revenue- meaning and various types of costs and revenue. Isoquants. Returns to a factor and returns to scale. Forms of the market – meaning and features. Price determination under perfect competition, monopoly and imperfect competitions, effects of shifts in demand and supply. Government Budget and the Economy: Government budget – meaning and its components. Objectives of the government budget. Classification of receipts; classification of expenditure. Types of the budget. Revenue deficit. Government Budget and the Economy: Government budget – meaning and its components. Objectives of the government budget. Classification of receipts; classification of expenditure. International Economics: Theories of international trade, free trade and protection, IMF – The World Bank and its associates. WTO. Tools and Interpretation: Measures of Central Tendency. Geometric mean and harmonic mean. Measures of Dispersion. Lorenz Curve: Meaning and its application. Development Policies and Experience: A brief introduction of the state of Indian economy on the eve of independence. Common goals of Five Year Plans, major controversies on planning in India. Main features, problems and policies of agriculture, industry and foreign trade. Current challenges facing Indian Economy: Poverty and programmes for poverty alleviation. Rural development: Key issues – credit and marketing – the role of cooperatives; agricultural diversification; alternative farming – organic farming. Human Capital Formation. Development Experience of India: A comparison with neighbours India and Pakistan, India and China, Issues: growth, population, sectoral development and other developmental indicators.